For edX, MOOC.org represents another step towards going beyond the boundaries of its current model, which includes partnership with institutions like Harvard, MIT, Stanford and other elite universities. In April, the organization merged with Stanford University-based startup Class2Go to build an open-source version of its platform that can be used by any institution around the globe. The goal has been to allow developers access to edX’s code to allow any institution to host and distribute digital courses for on-campus and distance learners — both online and offline — and create better ways to collect student data. With today’s partnership, edX is expanding that mission, as its partnership with Google will enable any institution or business to post courses on MOOC.org and presumably open the doors to public access of edX’s content. It will also offer a more diverse range of content from non-profit institutions to higher education institutions and businesses, edX President Anant Agarwal said. However, while edX has been building out its own open-source platform, Google said in its blog post today that it will be hosting MOOC.org in its own cloud and — not only that — it will also be lending a team of developers to the partnership to help develop Open edX, the organization’s aforementioned open-source MOOC platform. In turn, for Google, its partnership with edX represents yet another step in its own foray into digital education — one that includes Google Play for Education, Google Apps for Education, and the launch of its own open-source course building platform, Course Builder, in September of last year. 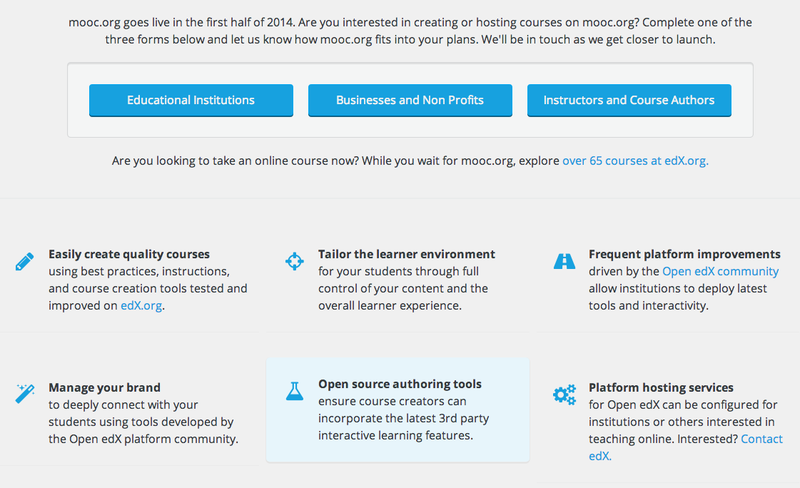 As to Google’s role in the MOOC movement and digital education, the company says that it will continue to “make contributions to the online education space, the findings of which will be shared directly to the online education community and the Open edX platform.” Of course, this partnership, like the Open Education Alliance, is still a work in progress. Details on what type of content, how it will be structured and just what businesses and teachers will be able to get out of the platform remains unclear. It’s still far too early to say what the ramifications are for Google’s partnership with edX and its participation in the Open Education Alliance. Certainly, if both can work towards promoting a “new meritocracy in higher education,” as my colleague Greg surmised in his recent post, they could collectively bring enormous changes to higher education and the scope and breadth of education as it exists today. Certainly, Udacity, edX and Google seem hellbent on recalibrating the focus of higher education and learning content, focusing on content that will help students learn how to become part of a modern, and increasingly more technical, global workforce. Whether the increasing role of Google and other tech companies in the educational landscape will be welcomed by academia is one thing, however, at the very least, these two experiments could serve to boost the profile of MOOC-style education, particularly of edX itself. It also seems to indicate the increasing likelihood that, whoever should win the battle to become the world’s largest open course platform, Google will be there to lend a hand — and share a piece of the pie.